Description: What you see here happens frequently in five-card-draw poker. Imagine that the woman has drawn one card to a flush. She will continue to take the top card from her hand and place it on the bottom. She’ll do this over and over until the action reaches her and it’s time to look. Motivation: She needs to improve her hand to win and doesn’t want to see how it comes out just yet. Building suspense is a common habit with some players; it usually happens when they figure that they don’t have the best hand and must, therefore, get lucky on the draw. 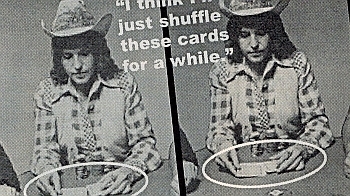 Discussion: When you see a player shuffling through his or her cards, you should figure that the hand requires help. Also, it turns out that there’s a much better than average chance that the player is drawing to an especially powerful hand. In draw lowball, many players shuffle only if they’re drawing to a bicycle (5-4-3-2-A, the best possible hand) or a six. Players seldom shuffle on less suspenseful lowball draws, such as one card to a nine. In high-hand-wins draw poker, there’s a very great chance that any player prolonging the suspense by shuffling his cards is drawing to a straight or a flush. Sometimes, you’ll find seven-stud players shuffling their three holecards before looking at their seventh (final) card. As you’d expect, among weak players, this generally means they must improve their hand to win.